Desi Sanchez was born in New York City, New York, USA as Adesina Sanchez. She is an actress and director, known for LatiNation (2004), eSports Report (2013) and Br5 (2012). Bailey Marie De Young is an American actress and dancer most well known for playing the characters Ginny Thompson on Bunheads, Lauren Cooper on Faking It, and Imogene Cleary on The Marvelous Mrs. Maisel. She and musician Tyler De Young were married on August 3, 2014. Miley Rose was born on June 1, 1994 in Israel. 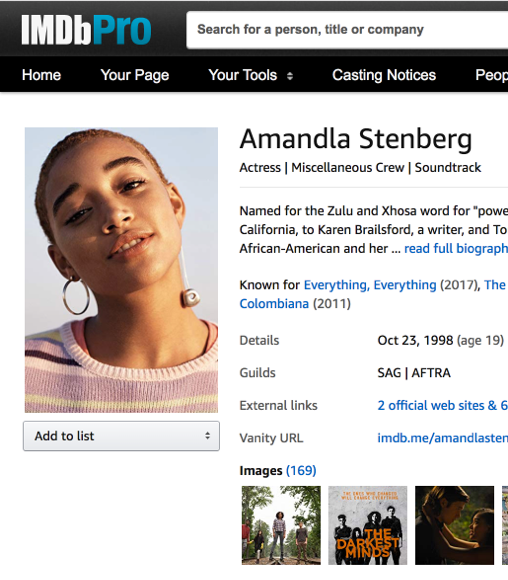 She is an actress, known for Casting Chloe (2018) and Phub Life (2015). Anna Grigorenko is an actress, known for The Incredible Adventures of Marco Polo on His Journeys to the Ends of the Earth (1998). Lauren Hanley was born as Lauren Victoria Hanley. She is an actress, known for Housesitters (2014), HUVr - HOW (2014) and HUVr - BELIEF (2014). Lauren Han is known for her work on Let Go of My E.G.G.O Morning Show (2016) and I Am That Girl (2008). Juliette Ford is known for her work on Ranam (2018), Encounter (2018) and The Break-In (2018). Marija Juliette Abney is known for her work on Black Panther (2018). Ivory Aquino is an actress, known for When We Rise (2017), Tales of the City (2019) and When They See Us (2019). Toni Lynn is an actress, known for White Palace (1990) and Bikini Drive-In (1995). Toni Hudson is an actress and producer, known for Just One of the Guys (1985), Leatherface: Texas Chainsaw Massacre III (1990) and Nothing in Common (1986). She was previously married to Judd Tyler Mintz, Dirk Benedict and Peter S. Rizzo. Lynn-Holly Johnson was born on December 13, 1958 in Chicago, Illinois, USA. She is an actress and director, known for For Your Eyes Only (1981), Ice Castles (1978) and The Watcher in the Woods (1980). She has been married to Kelly James Givens since November 12, 1994. They have two children. Lynn Loring made an unlikely, but impressive, transition from child actress to actress to president of a major TV studio. Claudia Verela is an actress, known for Semblance (2016), Art of Roxanne's Clippered Haircut (2015) and Art of Tina's Wedge Pixie Haircut! (2015). Laura Crosby has been married to Ben Stein since April 8, 2011. Laura Crane is an actress, known for Love Is... (2017), Mysteries of the Unexplained (2017) and My Life for Yours (2017). Cristina Rosato was born on January 6, 1983 in Montreal, Quebec, Canada. She is known for her work on Mother! (2017), Little Italy (2018) and Assassin's Creed: The Ezio Collection (2016). Christina Rose is an actress and producer, known for Fallout 76 (2018), World of Final Fantasy (2016) and Broken: A Musical (2015). Christina Rosenberg is known for her work on Dracula's Curse (2006), The Beast of Bray Road (2005) and King of the Lost World (2005). Spanish actress Christina Ochoa is best known for her current roles on TNT's Animal Kingdom and as the lead for SyFy's Blood Drive and The CW's Valor. Tia Naris is an actress, known for Nancy in Hell (2016), Made For This and Sit Still Look Pretty SuzanMarie Ghaleb: Cover (2016). Sophia Marzocchi is known for her work on Divergent (2014), Red Dead Redemption (2010) and Small Town Saturday Night (2010). Sophia Maria Lesseos is an actress, known for Double Duty (2009) and Americas Superwoman, Next Action Diva (2012). Sophia Marcs is an actress and writer, known for Stirred (2018), 13 Reasons Why (2017) and Sharp Objects (2018). Candy Clark was born on June 20, 1947 in Norman, Oklahoma, USA as Candace June Clark. She is an actress, known for American Graffiti (1973), The Man Who Fell to Earth (1976) and Blue Thunder (1983). She was previously married to Jeff Wald and Marjoe Gortner. Stunningly comely and slinky brunette Lina Romay rates highly as one of the boldest, most sensuous, and enticing actresses to have appeared with tremendous frequency in a large volume of European horror and exploitation features made from the early 1970s to the early 21st century. Lisa Linde was born on May 10, 1972 in Nashville, Tennessee, USA as Mary Elizabeth Linde. She is an actress, known for Pacific Blue (1996), Days of Our Lives (1965) and The Darkling (2000). She was previously married to James Marsden. Gracie Rae is best known for her roles in Heroes and Next of Kin. Recently stared as Marilyn Monroe in Night at the Studio, Einstein's wife in Einstein: The Prelude and staring as the lead role of Emma in the upcoming action film Breaker; Gracie Rae is an extremely diverse young character actress. Sherrie Rose is an award winning and critically acclaimed filmmaker, actress and writer. She studied writing at UCLA and previously electrical engineering and theatrical performance as dual majors on the Dean's list at USF. Eva Cifrová was born on July 1, 1982 in Bratislava, Czechoslovakia. She is an actress, known for Vystrel navyse (2011), Top Star (2011) and Spravne Cislo (The Right Number) (2008). Actress | Thee Recluse: Thieves in the Temple. Candi Brooks is known for her work on Preacher (2016), NCIS: New Orleans (2014) and 21 Jump Street (2012). Born in Los Angeles but raised in England, Belgium and Texas, Candace Kita graduated from college with degrees in philosophy and contemporary religion. After postgraduate work in sociology, she chose to pursue her dream of acting. Bethanie Ho is an actress and costume designer, known for Air Emergency (2003), Clara (2018) and Crawford (2018). Bethany Brown is known for her work on The Flash (2014), Rogue (2013) and The Mountain Between Us (2017). Paulette Braxton was born on January 31, 1965 in Houston, Texas, USA. She is an actress, known for A Night at the Roxbury (1998), Homeboys in Outer Space (1996) and Lockdown (2000). Lyanna Tumaneng is an actress, known for Letters to God (2010), The Fiesta Grand (2007) and Zombies! Zombies! Zombies! (2008). Danielle Fornarelli is an actress, known for Transformers: Dark of the Moon (2011). Angelique Boyer was born on July 4, 1988 in Jura, France as Angélique Monique-Paulet Boyer Rousseau. She is an actress, known for J-ok'el (2007), Alma de hierro (2008) and Rebelde (2004). Francesca Buller was born on January 20, 1964 in the UK. She is an actress, known for Farscape: The Peacekeeper Wars (2004), Chaplin (1992) and Farscape (1999). She has been married to Ben Browder since 1989. They have two children. Angelique Cabral was born on January 28, 1979 in Honolulu, Hawaii, USA. She is an actress and producer, known for Life in Pieces (2015), Enlisted (2014) and Friends with Benefits (2011). She has been married to Jason Osborn since July 20, 2013. They have one child. Angelique Lewis is known for her work on American Pie Presents: The Naked Mile (2006), Mean Girls (2004) and Warehouse 13 (2009). Angelique Sky is an actress, known for Zombie Apocalypse: Redemption (2011), Zombie Apocalypse: Chronicles - Raider Recon (2011) and Sirens of Chrome.